Perfect for burning spinnerbaits, pitching jigs and fishing topwater baits, the Quantum Kinetic PT Baitcast Reels feature seven strategically placed PT bearings to deliver clean, effortless performance at a great price. 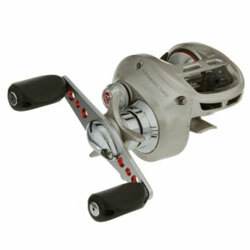 In addition to the one-piece aluminum frame which will not flex while holding all critical components in perfect alignment, the Kinetic PT also features ACS external adjustable centrifugal braking, Continuous Anti-Reverse, MaxCast skeletal spool, multi-coated finish, ceramic drag, aluminum handle and lube port. "I bought this reel the other night and fished it the next day. The reel was AWESOME! Performed well above my expectations and will buy 2 more this week. Didnt backlash once!" "well this reel is some what ok, but the drag does not work. i set my drag on as tight as it can be and it still takes little effort to take the drag. this disapointed me." "I bought this reel and right out of the box I was amazed at the appearance. I put it on my Vendetta rod and it casted great. Excellent reel at an excellent price. Quantum has produced another great product. Buy the Quantum Hot Sauce for lubrication though."